Prevision Hybrid 54 is exclusively provided by Prevision Casino Games, it will guarantee the players an exciting and unprecedented gaming experience. Different from any other Prevision card games, Prevision Hybrid 54 provides betting on 'Suit' and 'JOKER', allowing the players more chances to win. Prevision Hybrid 54 provides betting on 'Suit' and 'JOKER', allowing the players more chances to win. The table layout for Prevision Hybrid 54 is simple and easy to use, most importantly players are able to continue betting until the very last second! When the timer ends, the system will randomly reveal a card as a result. When the timer ends, the system will randomly reveal a card as a result. The main betting areas in Prevision Hybrid 54 are mainly divided into 'Suit' and 'Rank', players are also able to bet on Colors and JOKER. 'Suit' will have 2 cards as a group, which is 2+K as a group, 3+Q as a group, and so on, ACE is an independent group. Example: If a player bets on 2 + K of Spades ♠, if the result is 2 ♠ or K ♠, then the player wins. If the result is JOKER, then all bets on all suits lose. 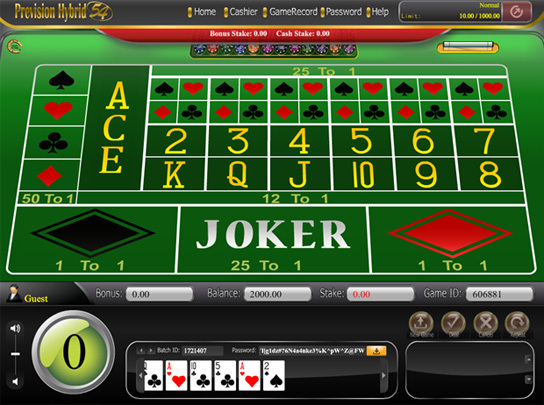 'Rank' allow players to bet on ACE, 2, 3, 4, 5, 6, 7, 8, 9, 10, J, Q, K, or JOKER, totals and suits are not taken into account. Players can also choose to bet on 'Red' or 'Black', however if the result is JOKER, then players will lose half their stake. Note: If the outcome is a Joker, all bets on Red and Black will lose half their stake.